You are all well aware by now that content is vitally important to your business. But how do you decide which content should be freely available and which content you ought to charge for? Is it possible to give away too much? People struggle with this question all the time. On the one hand, giving away information clearly works. After all, Copyblogger is based on that premise. That said, we know that selling information is good business. Of course the answers will differ between different industries, topics, businesses, and writers. But hopefully I can help you arrive at an approach that works for you. 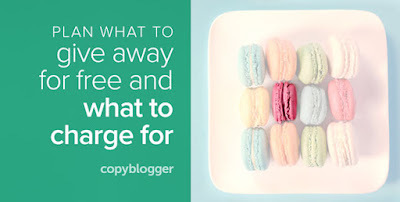 The reason you are putting together all these free articles, podcasts, videos, and presentations, is that you want to attract an audience that grows your business. We want more people — specifically our most sought-after prospects — to be aware of us. Of those, we want as many as possible to keep coming back, and to opt-in to our email. If all of your content is behind a barrier, then this goal is going to be more difficult to achieve because you will have fewer opportunities for visibility. The more content you have out there in the open, the more opportunities to reach your prospect exist. It’s not just prospects that you want to connect to. With your ideas, experience, and knowledge out on the web for anyone to consume, you are going to attract industry, networking, and partner contacts. What is the problem that you solve? What can you help them achieve? It’s going to be tough to get people to pay money before they know what you can do for them! People often put their problems into search engines looking for answers. You want to make sure your solutions can be found when they go searching. Your free content will not just educate, it will also show your uniqueness. It will inform people why they should connect with you versus other people, and why your approach or solutions have the advantage. Once a prospect has started to get to know your value, then they will have more questions … of the “yes, but” variety. It’s best to answer these objections and put your prospect’s mind at ease before those objections become reasons to not do business with you. Answering objections also demonstrates your empathy — and the service provider who best shows they understand a prospect’s problem tends to be the one who gets the business. A great way to answer objections, and to establish yourself as the go-to person, is to prove your value through existing results and case studies. Sometimes your prospects will not warm up to your solutions right away. They need to know what you are talking about and why it is important to them. Providing “serving suggestions” and “use cases” allows your prospect to understand how what you do fits into their life or business, and to imagine getting those benefits. Tutorials and demonstrations can also help existing customers get more out of what they paid for. When your business makes money by selling advice or information, it is a good idea for your prospects to get some early results. This allows them to build trust with you so that they feel confident that your more in-depth or advanced information will also deliver on your promises. The quicker and easier they gets these results, the more “bought in” they will be. In many industries, who you work with can be as important as what they do for you, especially if they will be working with you closely for a while. In general, we prefer to work with people we actually can stand being around. That means establishing your personality in addition to your credentials. Use personal anecdotes and let your voice come through your free content. Sonia Simone calls the concept “Cookie Content.” This idea is crucial. You want your readers to look forward to your articles, videos, podcasts, and seminars. That means the time they spend with you should be time well spent. They should be informed and entertained. Your prospect needs to perceive that there is more good stuff to come, so that they will want to deepen their relationship with you. A good habit to get into is to always provide actionable takeaways and ideas the audience can use. Hopefully that will give you plenty of ideas. 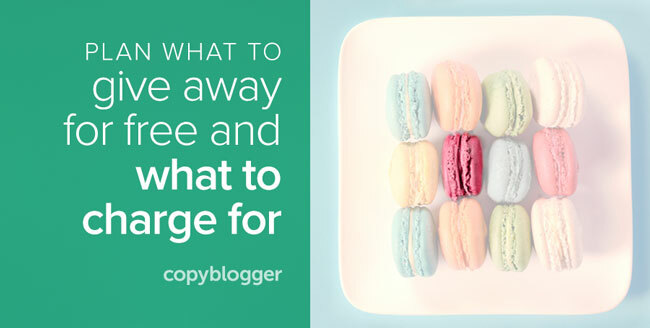 If you are giving away so much value in the free content, what are people going to be willing to pay for? It’s my instinct to give a lot, but there is a circumstance where your information is worth holding back and providing only to paying customers. … then they will be much more willing to invest in your solution. People still innovate. People find new approaches. Every day, new technologies are developed. Brand new systems are tested and released. Of course as soon as you start sharing this information, someone you have shared it with will inevitably start sharing it too. As more and more people fight against the noise in their marketplaces, you will see more and more valuable information being shared for free. With all the free content out there, you would be forgiven for believing that’s all anyone really needs. But, actually, paid content has never been more in demand … from books to coaching to training courses. In general, your free content is going to be a collection of granular, randomly organized pieces of the puzzle. People will happily pay to be given the whole thing wrapped up in convenient packaging — even if the information was previously available for free. An example is this ebook by Darren Rowse. I was shocked when this first happened to me, but I have since found this is true in many niches. When I started out, I was giving away articles that helped developers solve programming problems. People started approaching me asking me to train and coach them, even though I thought there was little I could add to the knowledge I had already put out there free to consume. The same thing happened with the Problogger book. It doesn’t matter how complete you think you have made your education, it only serves as better proof that you are the person who can best help. A great example of this is our own Authority training and networking community. Of course people will always want the secrets or to be “an insider” … especially if these secrets will give them an unfair advantage over competitors. The quality of your information is paramount, but people will be willing to pay more for higher quality production value, more comfort, and the latest technology. How much of a difference this makes can be difficult to predict. It’s an often-shared piece of advice, but it is true: People will forget what you say, but they will remember how you made them feel. Yes, people happily pay for things, but we really value a memorable experience. If you can entertain, inform, and provide a stellar experience, then you are going to create something truly valuable. So now you have some ideas of what you should give away, and what you can sell, but how do you know if your free content idea is a good choice? Don’t be tempted to answer every question or to answer questions too completely. This is partly because you may be overwhelming your audience rather than helping them. And partly because, as mentioned above, someone who has not paid will have less trust and patience for you to get to the point. It’s good to give some ideas and tactics, but you need to work up to introducing your full strategies and systems on the paid side. Consider giving away step one, or even steps one, two, and three, while keeping the remaining steps back for paying customers only. Don’t make the mistake I did of being too available, too much. Your time and energy is limited. Don’t give away access to you, and certainly limit how much support you provide for your free stuff. Hold the customer’s hand through the entire process if you like, but free readers should not expect white-glove treatment. People are willing to jump through hoops after they have discovered there is value on the other side. This means the first free content a prospect discovers should have zero barriers to consumption. If you need a degree and a spy decoder ring to understand your free content, then people will not put in the effort. They might even think bad things about you. Your job is to help, not confuse people or impress them with your massive intellect. People will put in effort once they are sure there will be a substantial pay off. But if a reader has only just discovered you, then they will lose interest long before they start seeing results, in which case you will have lost their attention and trust. People worry about this issue of which content to sell and what to give away for free. And yes, it involves a lot of subjective judgment. But the good news is that I have yet to find someone who has given away too much. As I mentioned earlier, you can give away everything you know and there will still be people who want to hear it from you — and who will pay you to help them implement it.